A great quake of magnitude 8.9 struck off the coast of Honshu, Japan, last night. Damaging tsunami and aftershocks followed. Fires broke out. Nuclear emergency declared. Hundreds killed. Public transport halted, trains missing. A magnitude 8.9 earthquake struck 130 km east of Sendai, 178 km east of Yamagata, on the island of Honshu, Japan at 6:46 p.m. last night, New Zealand Daylight Time. The undersea earthquake, centred 373 km north-east of the capital, Tokyo, was 24 km deep. 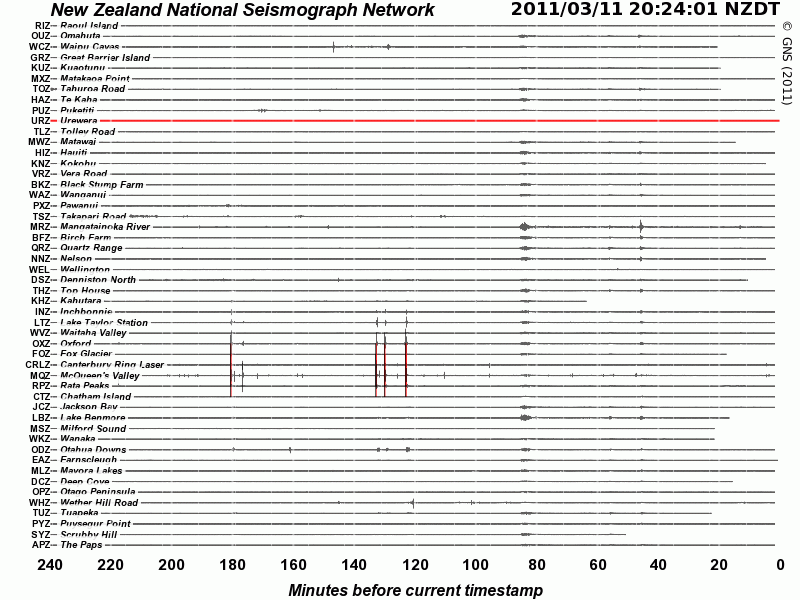 [click for larger image] New Zealand’s seismograph network clearly showed the traces of the magnitude 8.9 main quake and the largest aftershock so far, a magnitude 7.1 earthquake 40 minutes later at 7:26 p.m.
Yesterday’s earthquake was preceded by an extraordinary burst of earthquake activity which included a foreshock of magnitude 7.2 and three of magnitude 6 on March 9th and 10th New Zealand time. Friday’s magnitude 8.9 earthquake is the 5th largest quake worldwide since 1900, ranking behind Chile (magnitude 9.5) 1960, Alaska (mag. 9.2) 1964, Northern Sumatra (mag 9.1) 2004, and Kamchatka (mag 9.0) 1952. It was not the much-feared Tokai earthquake, which is now significantly overdue. This earthquake is expected to occur on the Tokai segment of the subduction zone under Suruga Bay, southwest of Tokyo. Tokai earthquakes occur every 80 to 140 years, with previous events occurring in 1096, 1361, 1498, 1650, 1707 and 1854. The quakes of 1707 and 1854 were â€œgreatâ€ quakes of about magnitude 8.4 eclipsing the Kanto earthquake (magnitude 7.9) of 1929 which killed 120,000 people and the Kobe quake (magnitude 7.3) of 1995 which killed more than 6,400. The earthquake occurred as the Pacific Plate thrust forward releasing pent-up strain that had built up from the westward movement of the Pacific Plate which moves west in the vicinity at 83 mm per year. Initial analysis shows that shaking was of a low frequency due to the slow rupture of the fault thereby reducing damage onshore. However, the large movement directed strong tsunami waves at eastern coasts of the island of Honshu. Tsunami of more than 7 metres were recorded at Soma, more than 4 metres at Miyako, Oarai and Kamaishi. Tsunami of 2 metres or more were recorded at many coastal locations on both Hokkaido and Honshu. Some of the waves swept 10 kilometres inland. Four passenger trains have been reported missing. Power cuts occurred in many cities and railway services were suspended, forcing commuters to spend the night in their offices if they were unable to walk home. The combined effects of the earthquakes and tsunami caused serious damage along eastern coasts of both Honshu and Hokkaido. The northern city of Kesennuma, population 70,000, is battling huge fires and is partially inundated by water. The much larger city of Sendai, closer to the epicentre, is facing similar problems. The Fukushima nuclear power plant has been shut down and a nuclear emergency has been declared as the reactor overheats. Evacuation of people within 10 km of the power plant has been ordered. In 2007, the Kashiwazaki-Kariwa power plant, the largest nuclear power station in the world which could generate a staggering 8,212 MW of electricity, was damaged by a nearby magnitude 6.8 earthquake and all seven reactors were shut down following a large transformer fire and the discharge of contaminated water into the sea. The plant was subjected to shaking which exceeded its design, requiring strengthening before generation could resume. Only two of the reactors have since been restarted. The tsunami generated by Friday’s magnitude 8.9 quake have travelled across the Pacfic, causing damage on North American coasts. Waves have reached 1.77 metres in the Galapagos Islands, 1.25 metres in Mexico, 2.02 metres in Crescent City, California, 1.74 metres in Hawaii and 1.27 metres at Midway Island. In the Marquesas, waves reached a height of 1.48 metres and travelled 30 metres inland. The first waves reached Raoul Island at 6:35 this morning and North Cape at 7:10 a.m. Warnings of a marine and minor land threat to some coasts of the North Island and the Chatham Islands have been issued by the Ministry of Civil Defence. Waves of 0.81 metres have been measured at Chatham Island, 0.35 metres at Jackson Bay, 0.33 metres at Lottin Point and 0.25 metres at North Cape. [click for larger image] GeoNet’s tsunami gauge network shows the sea level disturbances at several coastal locations in New Zealand. 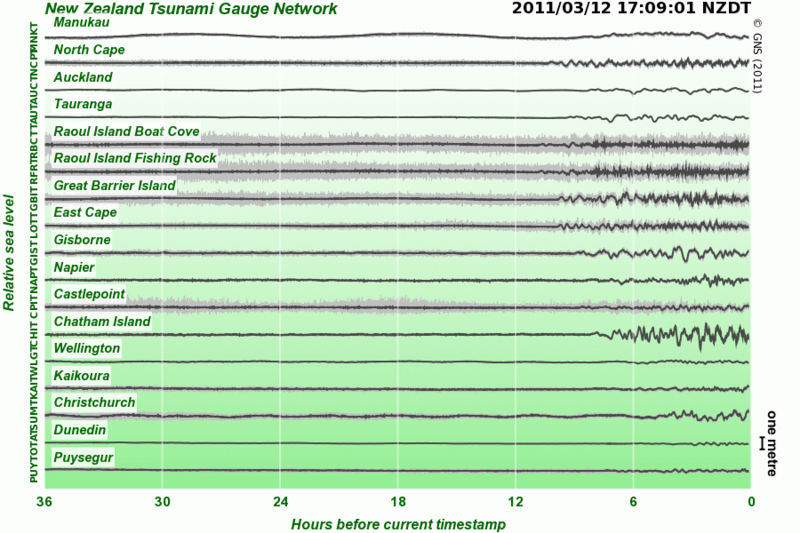 The biggest fluctuations show on the gauges for Gisborne and Chatham Island. Strong aftershocks have followed the main quake, with activity spreading well away from the epicentre of the initial earthquake. Japan has been relentlessly shaken by 22 magnitude 6 aftershocks and one event of magnitude 7, with quakes centred off both the west and east coasts and two onshore quakes of magnitude 6.8 and 6.2. Most of the activity has been spread along a 400 km stretch off the eastern coast of Honshu and is continuing. This entry was posted on Saturday, March 12th, 2011 at 5:39 pm and is filed under Earthquakes - Observations. You can follow any responses to this entry through the RSS 2.0 feed. You can skip to the end and leave a response. Pinging is currently not allowed.